, an eminent French botanist, was born at Paris in 1746. In 1772 he was appointed superintendant of the waters and forests of the generality of Paris, and his active mind being turned to fulfil the duties of his office, he began to apply to botany, with a particular view to the knowledge of foresttrees. 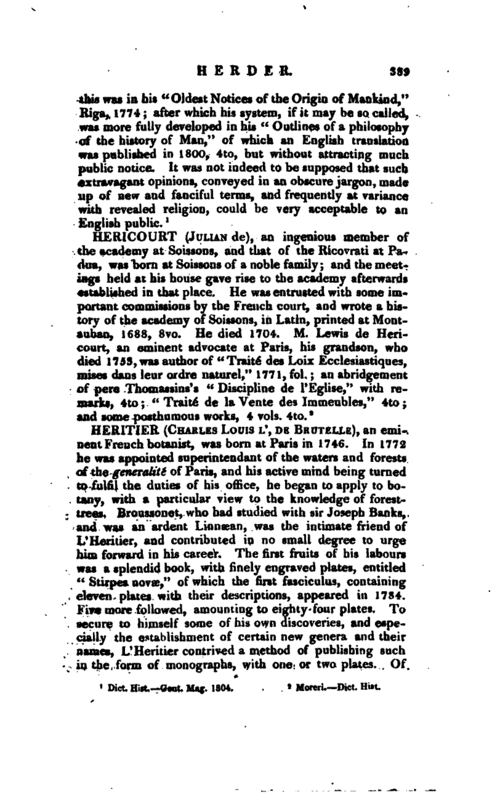 Broussonet, who had studied with sir Joseph Banks, and was an ardent Linnaean, was the intimate friend of L’Heritier, and contributed in no small degree to urge him forward in his career. The first fruits of his labours was a splendid book, with finely engraved plates, entitled “Stirpes novae,” of which the first fasciculus, containing eleven plates with their descriptions, appeared in J7S4. Five more followed, amounting to eighty-four platas. To secure to himself some of his own discoveries, and especially the establishment of certain new genera and their names, L’Heritier contrived a method of publishing such in the form of monographs, with one or two plates. Of | these he distributed the copies gratuitously to different people, so that no individual might be possessed of the entire collection. A complete set, however, is in the library of sir Joseph Banks, and another in that of the president of the Linnaean society. In 1786 he came over to England, and collected from the English gardens the materials of his “Sertum Anglicum,” a Work consisting of several fasciculi, on a similar plan to his Stirpes Novafe, but it remains unfinished. In 1775 he became a conseiller a la cour des aides, was for a long time the dean of that court, and accepted the office of a judge in the civil tribunals of the department of the Seine, and is recorded to have fulfilled its duties with the most exemplary rectitude and incorruptibility. He also sat from time to time as a member of the representative body. His views were always those of a true patriot, the correction of abuses, the maintenance of the laws in their genuine force and purity; and the darling object of his emulation was the uncorrupted British constitution. 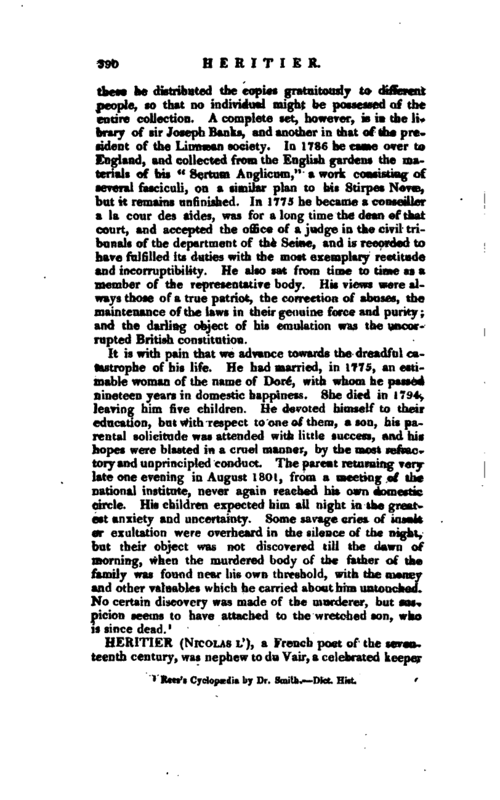 Rees’s Cyclopædia by Dr. Smith. T —Dict. Hist.